Last month, Daniel Joshua Phares, 46, pleaded no contest to a misdemeanor count of making criminal threats. San Luis Obispo County Judge Matthew Guerrero sentenced Phares to 18 months of formal probation and required Phares to complete 10 hours of anger management counseling and write letters of apology to three Women’s March organizers. The sentence also required Phares to refrain from owning or possessing firearms and ammunition for 10 years. Days later, on Dec. 20, Phares was arrested for violating his probation and booked into the San Luis Obispo County Jail. He has since remained in custody. 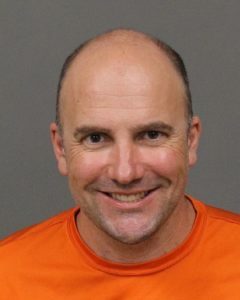 On Monday, the San Luis Obispo County District Attorney’s Office charged Phares with felony unlawful possession of ammunition. Phares appeared in court on Wednesday and pleaded not guilty to the possession of ammunition charge. Deputy District Attorney Chris Peuvrelle said during the hearing that Phares was found in possession of about 100 rounds of ammunition for the AR-15 he relinquished, as well as an undisclosed number of knives and a crossbow. Peuvrelle requested that Judge Ginger Garret raise Phares’ bail to $35,000. Garret approved the bail increase request, saying Phares poses a public safety risk. Phares’ attorney, Jim Royer, argued against the bail increase, saying his client was trying to sell the ammunition after the court ordered he give up his firearms. Royer said Phares was a little naive about formal probation. During the initial court case, Phares trolled the victims, alleging hypocrisy by the Women’s March in not honoring Marilyn Pharis, a woman who was sexually assaulted and killed by an illegal immigrant. Phares also trolled Judge Guerrero during the sentencing hearing. Guerrero told Phares, if he was found in violation of his probation, he could be booked in jail on a flash incarceration without a court hearing for up to 10 days. During the sentencing hearing, Peuvrelle said he had been extremely disappointed with Phares’ behavior since the plea agreement was reached and that he planned to ask for substantial time in custody if Phares failed to abide by the requirements of his probation. Phares currently remains in jail in lieu of $35,000 bail, an amount $20,000 higher than the level at which his bail was set following his Dec. 20 arrest. While it may be legal to possess the items seized by the Probation Dept. their legality is irrelevant. The probationer was ordered by the Court to not be in possession of any weapons or ammunition He simply didn’t take this order seriously. Also, keep in mind that probation is voluntary. If he was intent on not giving up his weapons and ammo he could have forgone probation and simply served out his jail sentence. Exceptional job to the Probation Officers who obviously took this case seriously. Why are knives and a crossbow relevant to this story? AFAIK, they are not legally forbidden by prohibited persons. Someone correct me (with a reference to the applicable statute) if I am wrong. To be fair 100 rounds of ammo is nothing and it’s not illegal to have ammunition. Secondly, threats shouldn’t be made but the women’s march people are a bunch of looney cat ladies who live in the richest place in the world and think they are oppressed. People who do honest work for a living don’t have time for this liberal nonsense. Likely he’ll figure out jail is no fun and do what’s necessary to stay out of there in the future. This guy sounds like he is a few cans short of a six pack.